Rating: Average 3.83 / 5 out of 6 total votes. Summary: A 15-year-old girl living her life until another 16-year-old girl comes along. They find themselves becoming the best of friends as they each discover the wonders of their home. A story following the life of a care-free girl who loves the sea! 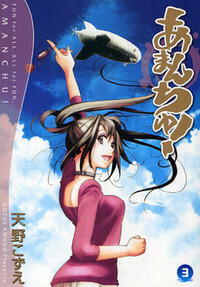 Hikari Kohinata is a cheerful 15 year-old girl who lives near the ocean and she spends much of her time diving as a result. On her first day of high school, she meets a teacher who also likes scuba diving. There's also a 16 year-old classmate, Futaba, who gets dragged along in Hikari's maelstrom as soon as they meet at school. Most of the manga so far details the relationship between the two girls, which quickly seems to move into romantic two girl friendship-territory. Alternate Names: あまんちゅ！, 海之少女, 藍海少女, Amanchu!